The other day, one of our engineers and I flew into CYTZ – Toronto Island Airport to visit with some of our customers in Toronto. 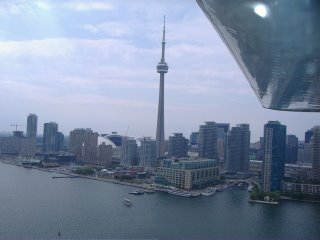 I told our engineer that landing at Toronto Island provides some great opportunities for some pictures, and I think this is the best picture he took. Having an airplane allows us to leave from our office, go to the local airport, get in our plane, and arrive at a customer’s offices in Toronto within four hours. The meetings in Toronto went very well, and we are looking forward to making this trip again.